Issues to Consider Before Filing | Denver Bankruptcy Attorney - Jon B. Clarke, P.C. Consult with Denver bankruptcy attorney Jon Clarke to learn more about the issues you need to consider before filing for bankruptcy. Businesses that are struggling to pay debt or that are facing other financial difficulties may wonder how to fix their financial problems. There are several bankruptcy and non-bankruptcy options that a stressed business may consider using to help it out of a tough spot. An experienced attorney can explain these options to you and help you make a decision that works for your business. Among the first issues to consider; is bankruptcy is necessary or is there a non-bankruptcy alternative that can alleviate its financial difficulties. If the business has few creditors or if the creditors agree to a workout, it may not be necessary for the business to go through the expense and hassle of a bankruptcy filing. In addition, there may be ways for a business to lessen its financial burdens before reaching the stage in which bankruptcy is a serious consideration. Cost-saving measures such as limiting expansion, selling unprofitable divisions and reducing waste in operations may help the business. If the business’ financial problems are only temporary, it may want to ask creditors to accept lower payments or to schedule payments over a longer period of time. Creditors may be receptive to these ideas if the debtor has paid on time in the past, or if the debtor raises the possibility of bankruptcy because creditors know that once a bankruptcy proceeding is initiated they will probably collect only a portion of what is owed to them. The term workout is used to describe a non-bankruptcy negotiated modification of debt. Essentially, a workout is an out-of-court agreement between a debtor and creditor(s) for repayment of debts, which is negotiated without all the procedural complications of the bankruptcy process. By entering into a voluntary agreement with creditors, the debtor avoids the stigma that attaches to bankruptcy but achieves the same results — discharge from all or a portion of his or her debts. In fact, a workout discharge can be even broader than a bankruptcy discharge, and it does not affect the debtor’s right to file a future bankruptcy, whereas certain types of bankruptcy discharges do. Alternative financing arrangements may solve some financial problems without resorting to bankruptcy. A business may opt to grant creditors a security interest or mortgage in inventory, fixed assets or accounts receivable. A composition is a contract between the debtor and two or more creditors in which the creditors agree to take a partial payment in full satisfaction of their claims. An extension is a contract between the debtor and two or more creditors in which the creditors agree to extend the time for payment of their claims. An agreement may be both a composition and an extension, in that the creditor agrees to accept less money over a longer period of time. There is no requirement that all of the creditors agree to a composition or extension, but most of them must voluntarily support it for it to work. 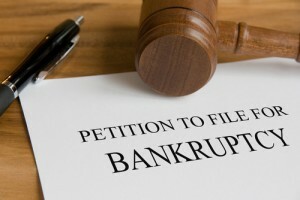 Once the debtor decides to file for bankruptcy, the business must decide under which chapter to file. This decision should be based on a number of considerations including the extent of the business’ debt, the type of business and the business’ post-bankruptcy goals. With respect to the first point, to be eligible for Chapter 13, the debtor must have less than a specified dolloar amount in unsecured debt and secured debt. 11 U.S.C. § 109(e). Thus, if the debtor does not meet this limit, but wishes to reorganize, Chapter 11 is an option. In addition, corporations and partnerships are not eligible under Chapter 13, but can file under Chapter 11. Another factor to consider is whether the business wishes to continue operations and whether it is financially able to do so. If the business has no other options for solving its financial problems or if its owners decide they no longer want to stay in business, a Chapter 7 liquidation may be the best option. If the business is just going through a rough patch, but the prospects look good in the long run, it may make sense to go through a reorganization of debts under Chapters 11 or 13. Under those chapters, the debtor stays in business and continues its normal business operations. Likewise, reorganization may be a good alternative where the business is worth more if it continues to operate than if its assets were to be sold. For example, if intangible things like good will, name reputation and key employees give the business value, it might be worth it to reorganize and save this value for the benefit of the debtor and creditors. In addition, liquidation under Chapter 7 may not be a desirable choice for a business that has substantial assets or the ability to increase profits with future operations. It is important to discuss all of these options with an attorney. A lawyer can explain the benefits and risks of your non-bankruptcy and bankruptcy alternatives and help you select a path that works for your business.